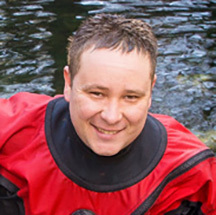 Jon Bernot began diving in the lakes in Oklahoma as a teenager. While attending the University of Oklahoma he worked towards and earned his Divemaster and Instructor certifications and graduated with a Bachelors in Political Science in 2004. Following service as a Marine Corps Officer he purchased his first dive operation in coastal North Carolina and taught recreational and technical courses while enjoying the world class wreck diving in the Atlantic. 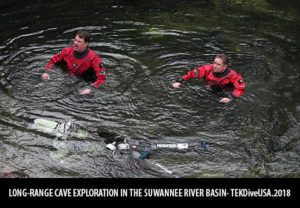 Beginning cave diving in 2008 he eventually moved to north Florida where he worked as a Service Manager for Dive Rite and became a cave instructor. Purchasing one of the larger north Florida cave diving operations in 2014 he has worked full time since then as a Cave, Technical, and Rebreather instructor and instructor trainer while working with his shop manager and wife, Kristi Bernot, to operate Cave Country Diving. He has held instructional ratings with PADI, PSAI, IANTD, and is currently the Training Chairman for the NSS-CDS. With nearly 3000 logged dives and over 1000 cave dives, technical diving has become not just a past time but a vocation. Recently passing the 27,000 foot mark for penetration in the Cathedral Canyon Cave System and leading multiple North Florida cave mapping projects, exploration time is balanced with time teaching the next generation of technical divers. A JJ CCR, O2ptima, KISS, and FATHOM instructor he has nearly 10 years of closed circuit experience coupled with hundreds of mixed gas dives on both Open Circuit and Closed Circuit. Realizing the value of education he also earned a M. S. in Environmental Management and writes frequently for technical diving journals. While enjoyment is gained from simply being in the water, his favorite dive is always a deep cave dive.